Historical, cultural, architectural and even culinary adventures are easy to find in Oslo, the capital of Norway. It’s small and compact; perfect for a short visit and easy to combine both urban and natural experiences. Located at the head of the Oslo Fjord, surrounded by forested hills most everything is available within a distance of 30 minutes with public transportation. “Thanks for your informative post (I realise I’m replying 2 years later) – I’ll be visiting Oslo next week, flying in from sunny Singapore, and I’m keen to see the ‘daily catch’ coming into shore. I have always wanted to visit and I hope it is not too cold, but pleasant. I’m really looking forward to visiting your lovely country with its fresh seafood!” You may also read his planning from the trip by clicking here! Opened in 2008, it’s the largest single cultural-political initiative in contemporary Norway and the only Opera House in the world where you can walk on the roof. Those who haven’t, read my earlier posts for further details: Recreational Culture for the People and New Oslo Opera House in Norway. The National Theatre – opened in 1899. Knowing Karl Johan by heart, it’s always easy to navigate in Oslo. Most everything else in the central city is reachable by foot in 30 minutes. So if you get lost: Just ask for Karl Johan (most Norwegian speaks English and even German or French) and you’re back on track again. Notice the old interior in The Old City Hall. 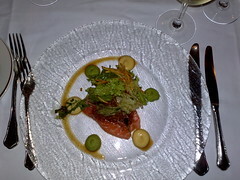 Left, starter: smoked trout – Right: main course: roasted reindeer. From the harbour he took the ferry on the Oslo Fjord to Bygdøy Island and explored the Maritime as well as the Viking Ships and the Folk Museum. Left: overview from the Monolith – Right: my favourite sculpture. 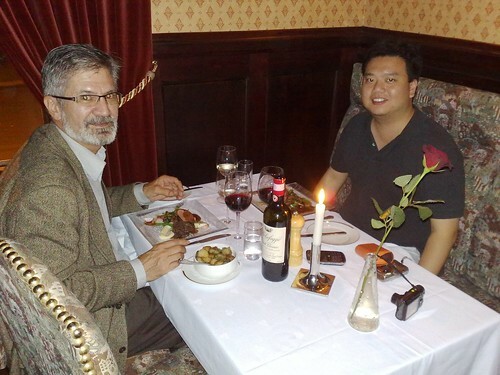 My wife DianeCA joined us for dinner in the evening. 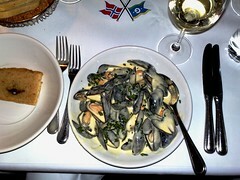 Left, starter: Wine steamed blue mussels, julienne vegetables and cream – Right: main course: Roasted monk-fish. The third day, he walked around all by himself as he now is well acquainted with Oslo. One of the highlights he reported was at a fish delicatessen where he saw newly caught cod, mackerel, salmon, catfish, monk-fish etc. – and even got a taste of herrings. He brought home some smoked Norwegian Salmon. Like I’ve said before: Who is next for a round trip in Oslo with me? As a network evangelist: I’m always up for more. If I manage to organize a Blog Gathering in August next year: Would you like to come? You know my name will be at the top of your list! Have I mentioned that we are now getting flash frozen Norwegian Haddock in our grocery store? I buy it all the time because it is the best Haddock I have ever eaten! I’m glad your able to get Norwegian Haddock – I just love it (steamed or roasted)! 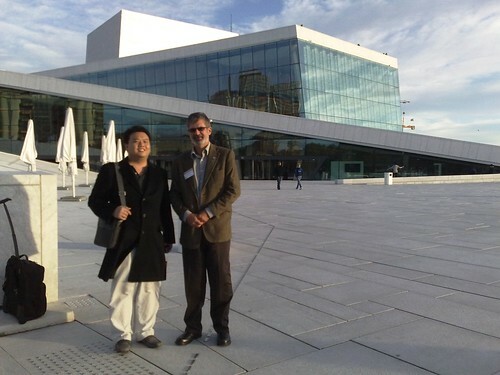 You had a such beautiful meeting in Oslo with the globetrotter from Singapoure!!! You know I’ll be in Oslo with Pierre for the next blogmeeting next august!!! Oslo becomes very familiary for me now since I read Terella!!! Vigiland park, the Grand Hotel and the opera!!! can’t wait to visit them not only in our virtual world and taste the right salmon from norway !!!! I love the beautiful white shirt Diane wears on the picture! OMG – I think I must visit Oslo, the capital of Norway more often. You know, we used to live downtown Oslo for many years. It’s so special in all it’s diversities. I’ve never been to a city with so many architectural and historical faces within walking distances. RenneyBA – this is a fantastic post and I hope your friend from distant Singapore left with a good impression. After all, we have had a wonderful “Indian Summer”. And yet another visitor! Well if you still have the Olympics in mind, I might have to figure out how to come see you guys first! Love the photo of the monolith and the views. 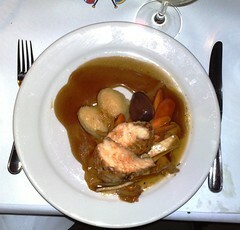 What stood out was the amazing food! I guess I miss that as we eat mostly raw food these days.. Very nice Renny :) – I’ll enjoy reading your blog! Does Reindeer taste simpler to deer meat? and do they actually have monk fish? cool..when I was in Mexico, I actually tasted Turtle for the first time, love the photographs and your details. Thanks Renny…Hope your having a wonderful day !!! Renny – I’ve said it before and I’ll say it again – you social butterfly you!! Your adventures always seem to include a good meal. That’s my kind of adventure. That is an excellent guide tour I must say: the most essential things to see during such a short time as you had together. 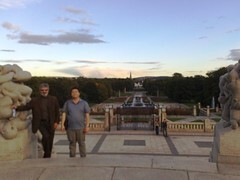 I have seen Vigelandsparken before, but it was in cold winter, so I’d gladly go there again when we comes to Oslo in August at our blog gathering event. Yes. We’ll definitely be there! You are such a kind host! :D Mr. Globetrotter is a lucky man :D! As you know I was supposed to visit your country this year (but unfortunately I couldn’t); but I think that you should organise a gathering for next year (I am sure lots of friends would come) :D! If I am in Europe by then and free, I might come. Lovely post! And God bless you! We have the same fav sculpture. btw. Vi har høstferie – med alle kattene. Ser ut til å løsne med avsetning, men de har enda noen uker igjen for å få riktig oppdragelse av sin mor. Noe som er viktig for nye “eiere” – det er jo omvendt, derfor i anførsel. It’s great to have such nice experience with strangers! Great post and good food! Renny you are amazing… you know how to entertain your guests. You are such a hospitable man. P.S. Congrats on the 100 Top Blog Award, I introduce you to others as the ‘spiritual leader’ of Norwegian bloggers! Well done! You are a wonderful host!! and what a great virtual tour for the rest of us. I’d love to be next. I really would. What a wonderful post. The food looks heavenly as well. I was impressed with your generosity! This is a few possible in Brazil because the people aren’t hospitable ( we are afraid). But we are very happy and affectionate, so I think I’ll adapt for a few days in Norway. I liked this Oslo pass! It must be wonderful! Is has the most hotel in Oslo (cost and benefit) and that it be near of tourist points? Thanks for your nice words and feedback! You may reach both Bergen, Stavanger as well as Trondheim by plane from Oslo in less than an hour. Oslo Pass cover public transportation and free admission to museums and sights – not accommodations. Looks like this adventurous traveler found the perfect host! You are quite the ambassador — Norway should really promote you! We both have commitments at home for the next few months, but I’m keeping fingers crossed. I have no words to thank you for the above mentioned beautiful post… Just Mind Blowing …. i’m already a big Fan of Oslo.. My father visited twice your amazing city & he have a number of stories & Pictures of Oslo.. & I wish to visit once i my life time Hopefully i will. plz share more… & Thanks for your foot prints on my side too. With Love from Pakistan. What a lovely day you’ve given your Singaporian visitor, Renny. 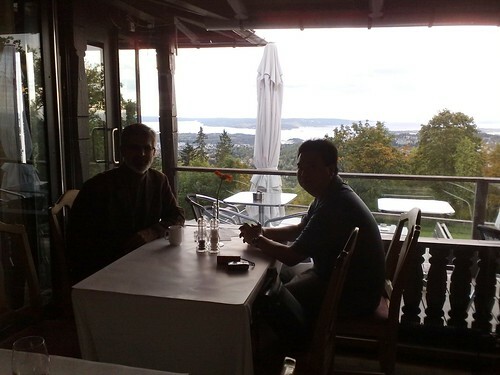 Oslo is truly a beautiful city and he certainly saw a lot of it with you…a very proud Norwegian. enjoyed watching your photos..i believed Oslo is a very interesting city! let me know Renny when your coming to Oktoberfest next year..your very welcome to go with us! have a great one! We just came back from 10 days to the Maritime provinces of Canada: New Brunswick, Cape Breton Island, Prince Edward Island and Nova Scotia where we ate a lot of fish dishes . Thanks for your comments on my blog while I was away. Congratulation on your award. Your tour of Oslo is quite informative and fun. 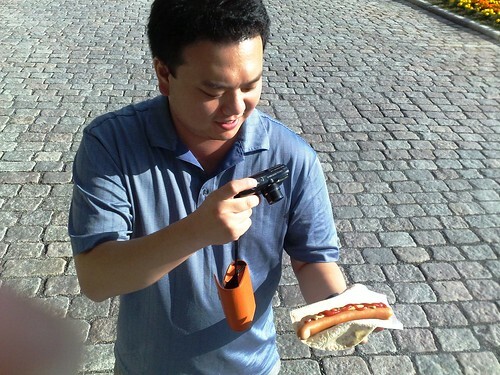 We ate a hot dog in Copenhagen a few years ago – the bread was different and the meal was quite tasty. Unfortunately, we came back home to a flooded family room and we are still cleaning up. We cannot complain as many people had water to the roof of their houses. I placed a few pictures of the flood in Georgia on my blog. 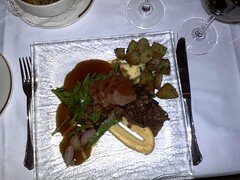 I remenber Lofoten Restaurant mummm delicios. Renny Il you dou a meeting of bloggers in Oslo ,please tell me.i like that if you doing a reunion over told me please. It would be very nice to meet you and of your blogger fans in Oslo. You are an institution in Oslo. I’m finally back to normal, and have adjusted to the local timezone back in Singapore. Thank you very much for your time (and Diane’s) and wonderful hospitality. 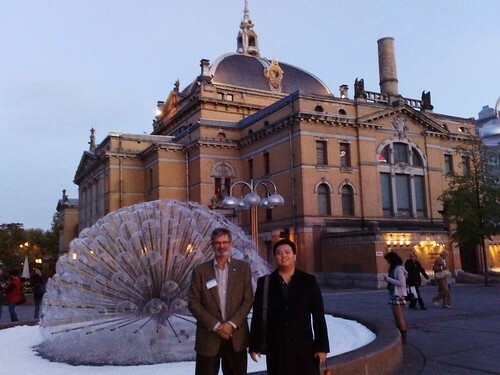 I will never forget my very short four days in Oslo last week! I have been busy showing everyone all the photos and videos that I took and I have many more friends who’re now wanting to visit your lovely country. I was most honoured to be your guest and will definitely come back one day! I had a great time and when I finally am able to compile all the media I took (photos and videos), I will post a full Trip Report at our website and let you know (of course!). Oslo is beautiful and you have made it even more so. I cannot thank you enough, but THANK YOU once again! It’s so nice of you Renny! 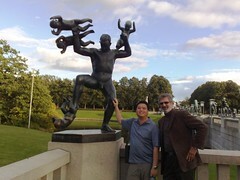 Me and Odd enjoyed the time with you in Oslo. We learned alot out of it as well. We hope to see you again and of course with Diane. What a wonderful time and experience for sure for our Singaporean fellowman :) If ever you come by to Singapore with Diane, do give me a buzz and I’ll be happy to show you around too. You are such a gracious host. 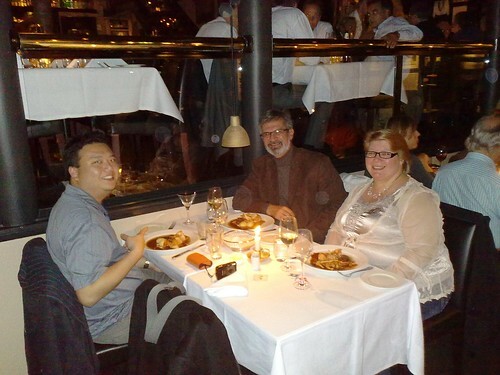 I’m sure your friend had a wonderful time going around Oslo with you. Very nice blog post! I visited Olso in July and really enjoyed the city, more especially Vigeland Park and the Oslo Fjord… and I found the Nobel Peace Center and the walking tour of Oslo that you can take with the Oslo Card very interesting too… Cheers from Rome! Its going to be hard to find this jersey in stores since its an older item, why not try a jersey that looks almost like it but with a much more affordable price? you can find basketball jerseys in stores like footlocker, footstation, sometimes even jc penny. Time Warner Offers a 2 for 1, I can’t find my last bill to see if I received an insert to give this password or not. Please submit an answer and if possible tell which offer it is for and what the offer is. Great site .. pls drop me a mail as I am thinking of visiting Norway soon as well and could do with your wealth of experience.